Forward Pilothouse Model – It’s big, handsome and seaworthy. 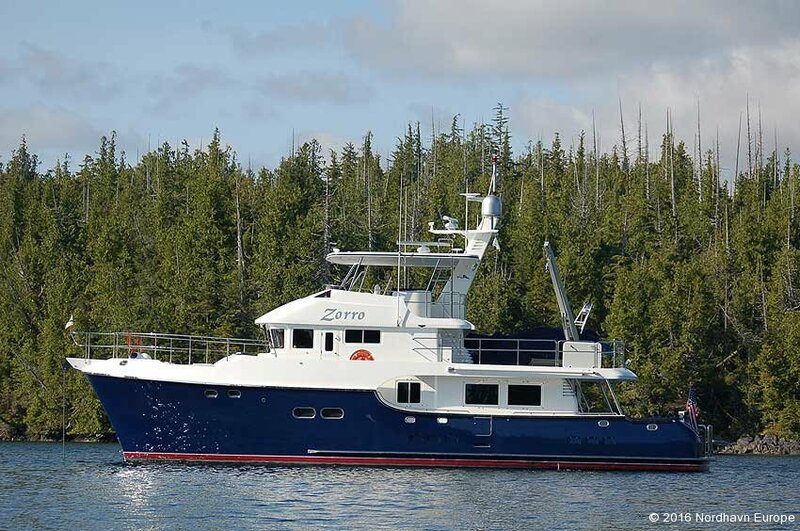 With plenty of living room, a long list of comfort and convenience features and the range and size to cross oceans, the Nordhavn 64/68 series has proven a popular trawler size, bridging the gap between the Nordhavn 55 and the larger Nordhavn 76. 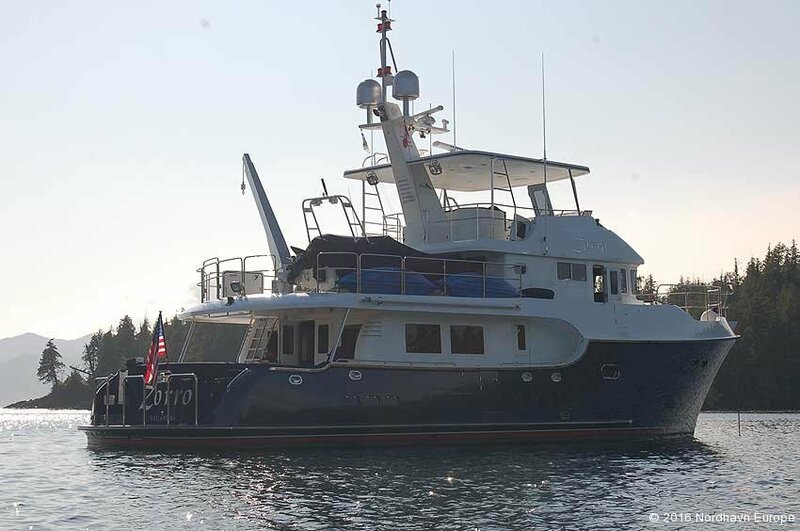 Built on the same extended hull as the aft pilothouse Nordhavn 68, the new forward pilothouse version retains the same interior layout as the Nordhavn 64, but adds four feet (1.2 meters) of length to the aft cockpit, increasing the outdoor living (and playing) space to 191 square feet (17.7 square meters). An additional benefit—one that’s always appreciated— is a larger lazarette. Compared to the Nordhavn 64, the N68 forward pilothouse enjoys the advantage of a slight increase in cruising efficiency because of its longer waterline. Compared to the Nordhavn 64, the N68 forward pilothouse enjoys the advantage of a slight increase in cruising efficiency because of its longer waterline. Compared with its aft pilothouse sibling, the forward pilothouse version has a slightly larger fuel capacity at 3,230/12,226 L versus 3,136 gallons/11,871 L for the aft pilothouse version. The saloon, galley, cabins and machinery spaces in the Nordhavn 68 forward pilothouse are the same size and layout as the Nordhavn 64. 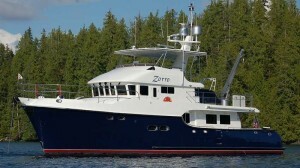 It’s an arrangement that some people prefer over the aft pilothouse version. 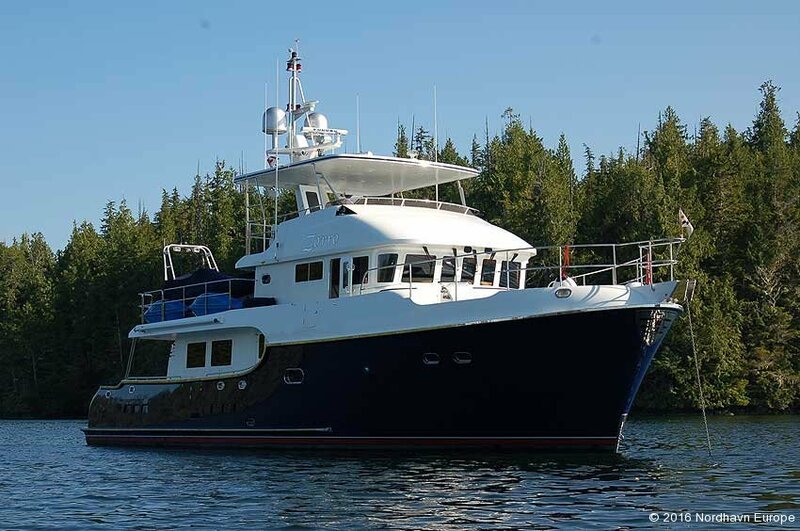 “In this layout, the advantage is you get the owner’s cabin closer to the middle of the boat,” points out Jeff Leishman, the Nordhavn 68’s designer and chief designer for Pacific Asian Enterprises. 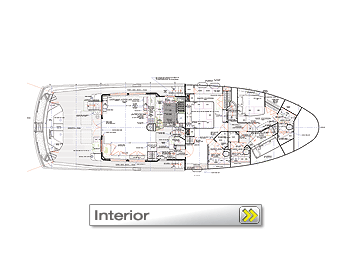 A cabin closer to the boat’s geometric center sees less motion and is therefore more comfortable at sea and at anchor. Also, since the cabin is located in a wider part of the boat, it’s roomier. The teak or cherry joinery used in the master and guest cabins, and throughout the yacht, reflects PAE’s high standards of workmanship. The head for the owner’s cabin features a tile floor, granite countertops and a teak vanity. The other big advantage the Nordhavn 68 forward pilothouse shares with the 64 is that the two guest cabins are on the same level as the living spaces—the galley and saloon. So, less time is spent climbing up and down stairs—climbing stairs can be a burden for older guests. Having the guest cabins just a few paces away from the owner’s cabin is also an advantage if a family lives on the boat and the cabins are occupied by children. The starboard cabin is equipped with bunks or twin beds and the port cabin has a queen-size bed. The guest head and shower are in the bow. Finished in teak, with granite countertops and a tile floor, it is accessible by doors in each cabin. 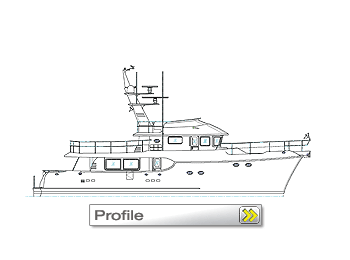 The roomy saloon, at 11 feet 3 inches by 17 feet (3.4 meters by 5.1 meters), retains the same space as the Nordhavn 64. To maximize living space, the saloon extends the full beam of the yacht on the port side. An 18-inch-wide (45 centimeters) walkway leading from the cockpit to the pilothouse and foredeck is on the starboard side, however a dual-walkway version can be ordered. There are two seating areas in the saloon with settees and tables, as well as a large lounge chair. Varnished teak or cherry wood paneling, premium carpeting and upholstery and soft overhead lighting make the Nordhavn 68’s saloon a relaxing place to spend time on a passage. The four 26- inch (66 centimeters) by 42-inch (106 centimeters), half-inch thick (1.2 centimeters) tempered windows afford an outstanding view of the changing scenery outside. Like all good sea boats, handholds are strategically placed throughout the living area. The 21-square-foot (1.9 square meters) galley adjacent to the saloon is fully equipped with first-rate appliances, including a Sub-Zero side-by-side refrigerator/freezer, and GE cook top and stainless steel convection wall oven. There are two additional GE freezers located in the utility room. The bull-nosed countertops are granite in the owner’s choice of colors. 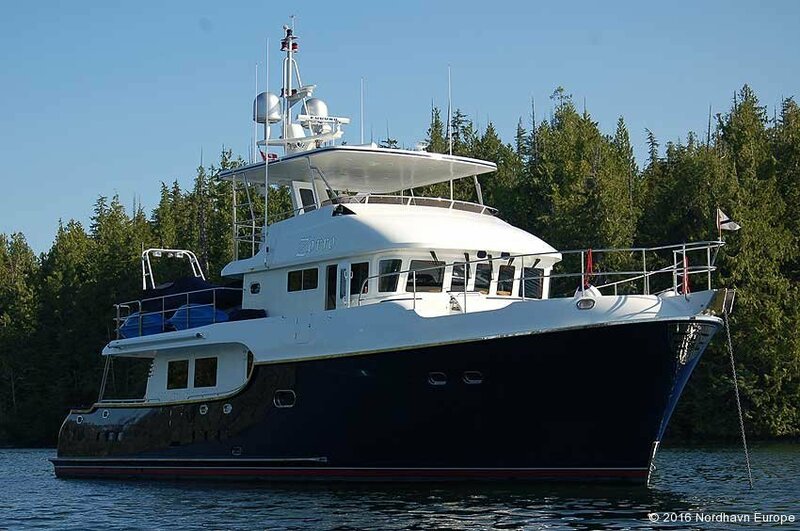 Up a short flight of stairs from the saloon and galley is the Nordhavn 68’s pilothouse. Though not as large as the aft pilothouse version, its location amidships, where motion is minimal, is another advantage it enjoys. The pilothouse measures a spacious 14 feet (4.2 meters) by 18 feet (5.4 meters), with a generous 6 feet 9 inches (two meters) of headroom. Paneled in varnished teak or cherry, it has a settee and table, double pilot berth where the off-watch can be close at hand during night passages or in inclement weather, and numerous cupboards, drawers, lockers and bookcases. It makes a great guest cabin when in port. Eleven half-inch thick (1.2 centimeters) tempered-glass windows offer a commanding view in all directions. The helm station features two Stidd slimline chairs, an instrument console 6 feet 8 inches (2.03 meters) wide, with plenty of room for instruments, gauges and controls, and a 30-inch (76 centimeters) destroyer wheel. Heavy-duty Dutch doors on either side of the pilothouse open onto the Portuguese bridge and boat deck. Another Nordhavn trademark and a necessity on a seagoing boat, the Portuguese bridge provides added security when one needs to step outside in rough weather. The boat deck’s location, up high and aft of the pilothouse, affords more protection in rough weather for the yacht’s tender than the aft pilothouse 68 offers. When it’s time to place the tender in the water, the davit will set it down next to the cockpit at the aft of the yacht, where it is easily boarded via boarding doors in the cockpit bulwarks, or from the swim platform. And when it’s time to tie up or cast off, skippers will find it’s a shorter run to the foredeck from the pilothouse’s mid-ship location. Control stations with thruster and engine controls, located on the port and starboard ends of the Portuguese bridge and in the aft cockpit, take much of the drama out of docking and undocking. A set of steps provides access to the boat deck from the cockpit. The foredeck extends for 16 feet (4.8 meters) beyond the Portuguese bridge. Twelve-inch high (30 centimeters) bulwarks topped with 30-inch high stainless steel railings extending all the way to the bow, ensure a secure working environment. The stainless steel double bow roller holds a 300-pound (136 kilograms) Airtex anchor on 400 feet (121 meters) of half-inch, high-tensile chain. A Maxwell hydraulic windlass, with two control stations, easily handles anchor retrieval. There is even a high-pressure wash-down system to get all the gunk and mud off the chain before it comes aboard. A nice touch that virtually eliminates the onerous task of occasionally emptying the chain locker and unplugging a drain clogged by muck. When the weather is nice, skippers will want to conn the boat from the flying bridge. Sitting a commanding 15 feet (4.5 meters) above the water, it is easily accessed using a stainless steel ladder on the boat deck or by steps leading directly from inside the pilothouse. The flying bridge is equipped with a full set of instruments and controls. A U-shaped fiberglass settee aft of the helm has seating for four around a teak table. There is also a wet bar and a Norcold refrigerator. This will probably be a nice place to hang out and share a sundowner. Stairs forward of the galley and saloon lead to the utility/laundry room—another feature missing in the aft pilothouse Nordhavn 68. Countertops, with drawers below and cabinets above, surround three sides of the utility room, and two GE freezers and Bosch combination washer/dryer are located there. There is also a day head. The utility room can also be ordered as a crew cabin, with two bunks (the lower one a double), a teakfaced closet, drawers and a shower. The utility room leads to the engine room through an insulated, watertight door. With 192 square feet (17.8 square meters) there is ample working space. Motive power for the yacht comes from a 425-horsepower, John Deere diesel engine turning a 42- inch (106 centimeters) propeller via a 3.5-inch (8.8 centimeters) Aquamet shaft and a Twin Disc transmission with a 3:43:1 reduction gear. A keel cooler and dry exhaust are standard. Steering is handled by a Kobelt hydraulic steering system, while ABT digital stabilizers keep everything on an even keel. The 38-horsepower hydraulic bow and stern thrusters make maneuvering in tight quarters a snap. The engine room also houses a Lugger L1066 diesel wing engine, with its own prop shaft, folding prop, fuel and cooling system, as well as the generator and an optional Village Marine Tec watermaker. 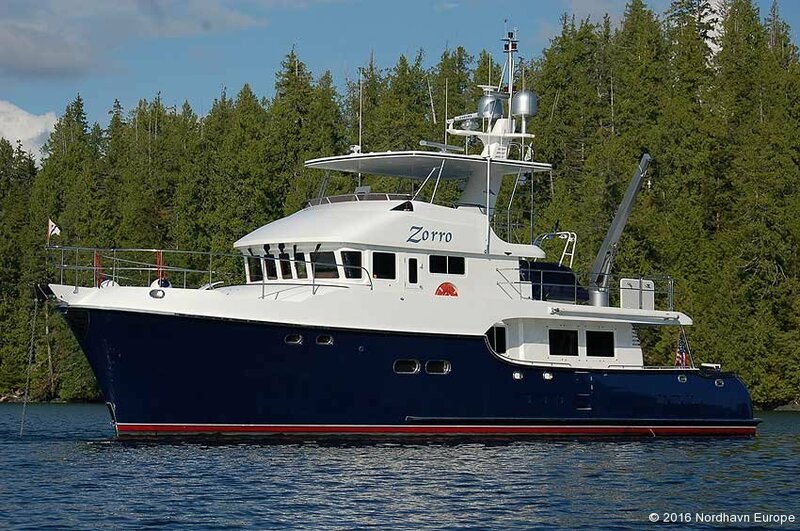 Two 250-amp, 24-volt hydraulically driven alternators supply electricity for the yacht’s various systems, and an additional 25-kilowatt Northern Lights generator supplies power for AC consumers such as the stove, refrigerator, freezers, air conditioning and the washer/ dryer. Shore power comes aboard via two 50-amp 240-volt receptacles and a 30-amp 120-volt receptacle. Two Glendinning shore power cord retrieval systems are also standard. Battery power is supplied by twelve 225-amp Lifeline 8D AGM house batteries. Two 4,000-watt inverter/chargers handle battery charging. 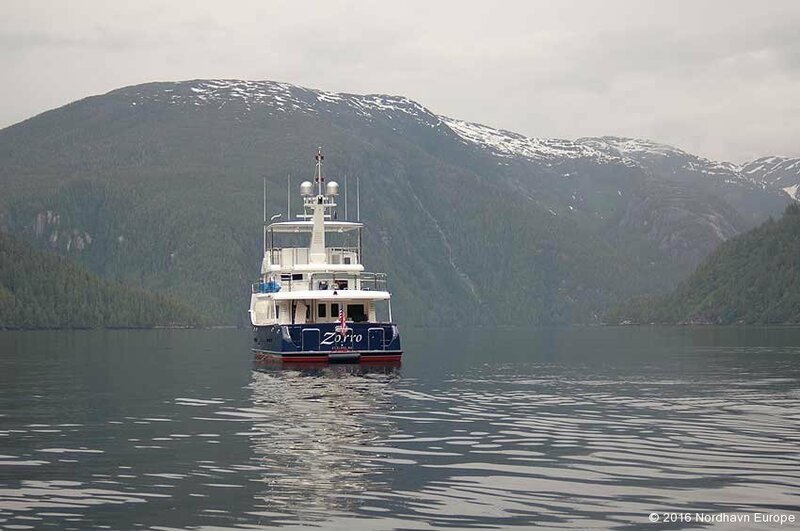 Although it is considered a production boat, PAE will modify the yacht during construction to accommodate the buyer’s wishes; however, there’s not much to add other than personal items, bedding and provisions. The Nordhavn 68 comes fully equipped—flying bridge, wing engine, generator, air conditioning, stabilizers, davit, appliances, even the plasma TV are standard. 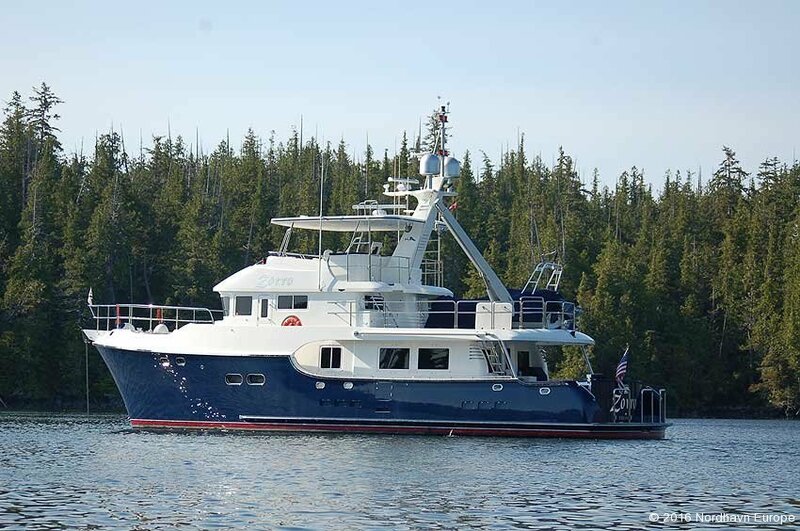 With so much to offer, there is no doubt the new Nordhavn 68 forward pilothouse, like its predecessor the Nordhavn 64, will be one of the most popular boats in the Nordhavn fleet. More capability, comfort and range can only make it better.